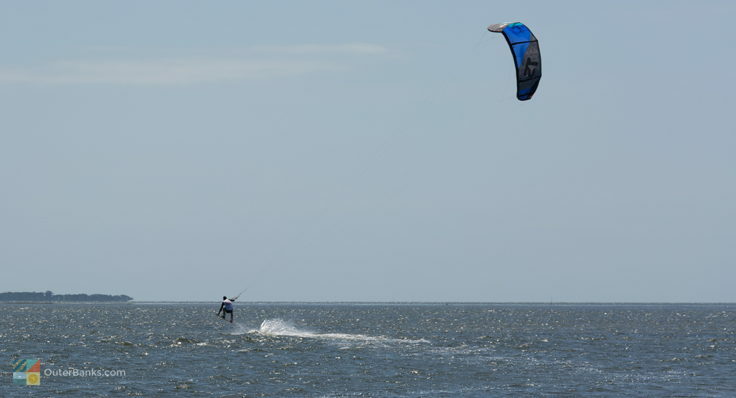 In fact, Canadian Hole has been the focal point of exceptional East Coast windsurfing for decades, and in the spring and summer months, Hatteras Island visitors will notice clusters of vehicles and expansive colorful kites swooping across the open waters of the Pamlico Sound. Every year, windsurfers will travel thousands of miles just to access this small stretch of shoreline, and after a day of riding the local winds, most all of these water lovers attest that the journey is well worth it. Truth be told, however, there's no pre-requisite that a visitor has to be an avid windsurfer or kite boarder to enjoy Canadian Hole's charm. The area is ideal for families with young children, avid beachcombers who want to explore what treasures are available outside the ocean beaches, and romantics who adore a fantastic and convenient sound sunset. Best of all, despite its big reputation, Canadian Hole still remains a small-town beach with plenty of elbow room, fantastic vistas, and a wonderful little slice of the Outer Banks landscape. Years after the Cape Hatteras National Seashore was established in 1953, (which comprises most all of Hatteras Island and Ocracoke Island's seashore), the National Park Service (NPS) went to work constructing 4WD beach access ramps, campgrounds, and public parking areas in some of Hatteras Island's most scenic locations. One of these new parking areas was a soundside public parking lot in between the villages of Avon and Buxton. With most of the attractions on Hatteras Island, including exceptional surfing, fishing, shelling, and simple everyday lounging, being located right off the Atlantic Ocean, this soundfront public area garnered little attention at first, being only visited by locals and visitors with small, easy-to-launch skiffs, and the occasional waterfront sunset lover who would pull in for one of the island's best vantage points for the daily evening show. This all changed in the early 1980s when the sport of windsurfing began to take off, literally, on a national and worldwide level. Local water sports lovers as well as visitors from upstate New York and Canada, who had started windsurfing across the Great Lakes, began experimenting on the waters off the Pamlico Sound, launching from the spacious yet desolate beaches of what is now Canadian Hole. 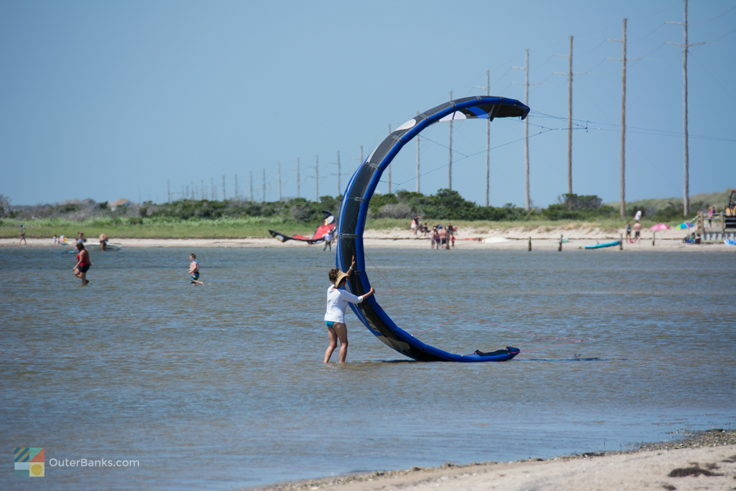 Their results were astounding, and visitors praised the Hatteras Island area for some of the best wind and water conditions on the entire Eastern Seaboard. 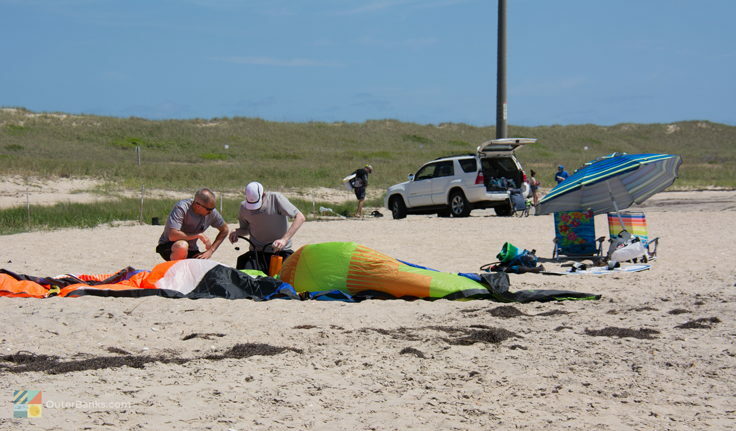 After all, in this locale, windsurfers can enjoy steady 15-20 mph winds that are sustained by the proximity to the Atlantic Ocean, as well as a 30 mile wide body of saltwater with few obstructions that's positively ideal for long, fast glides. Word got out quickly among the ever-expanding windsurfing set, and by the late 1980s, hundreds if not thousands of windsurfers had made the long expedition to the newly named "Canadian Hole," a moniker honoring its roots as a windsurfing paradise, discovered and popularized by Canadians. 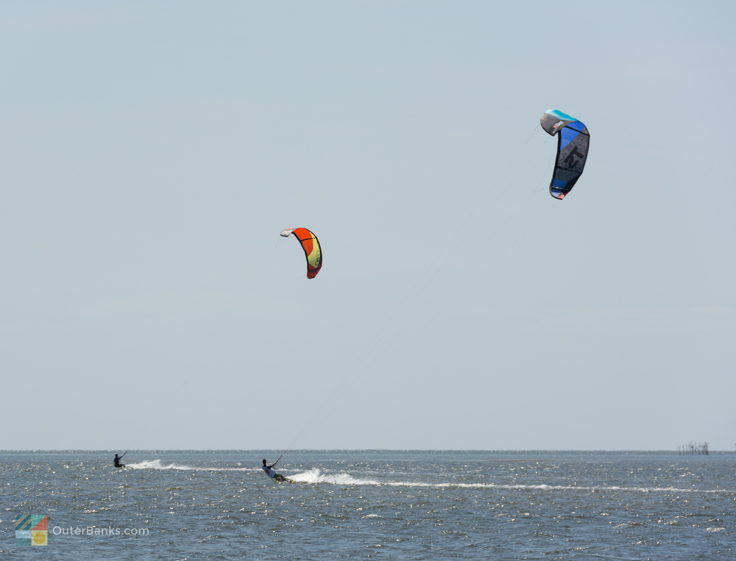 In the late 1990s and early 2000s, kiteboarding began to take the Outer Banks by storm, and initially, kiteboarders landed on Canadian Hole for the best wind and water conditions. A large cluster along Canadian Hole ensued, and kiteboarders soon after staked their own beach, Kite Point, located just a hundred yards or so away, but still facing the same great conditions that the neighboring windsurfers enjoyed. This segregation of windsurfers and kiteboarders was more or less intentional, but was created out of necessity. Because windsurfers glide along at a somewhat slower pace, and both sports require expansive plots of land for set-up and rigging, it was only natural that windsurfers would drift one way, and kiteboarders would drift the other. Along the way, Canadian Hole also gained popularity among young families and beach lovers, who found that even an exceptionally windy day could be enjoyed in the quiet, soundside waters of this soundside area. Sunset lovers soon also flocked to the area, even if they were simply en route to Buxton or Avon and decided to pause for a few minutes to watch the sun set into the Pamlico Sound. In recent years, kayakers and stand up paddle boarders have also discovered that Canadian Hole is an ideal launching point for their sport of choice, and as a result, Canadian Hole today is a happy mix of families, windsurfers, kayakers, kite or stand-up paddle boarders, all enjoying the same stretch of small but beautiful Outer Banks coastline. One of the reasons why Canadian Hole stands out among other NPS managed public soundside locations is its ample parking, restroom facilities, and showers. The public showers are seasonally open to visitors, and consist of large poles springing out from the decks for a nice but efficient outdoor rinse. Restrooms are also seasonally open, however the parking area, which can easily accommodate 4 dozen vehicles, including campers and RVs, is open year round. Canadian Hole is not hard to find, and is located on the soundside of NC Highway 12 almost exactly in between Avon and Buxton villages. Several brown NPS signs mark the spot, but most spring and fall visitors will be able the see it from miles away, by the number of windsurfers that are gliding along just offshore. The locale is unique in that is offers open water Pamlico Sound views, as well as a distant view of the Cape Hatteras Lighthouse. With this in mind, visitors are encouraged to bring a camera along, as the photo ops of windsurfers and distant kiteboarders, scooting against the backdrop of the water and the Cape Hatteras Lighthouse, is simply unparalleled. 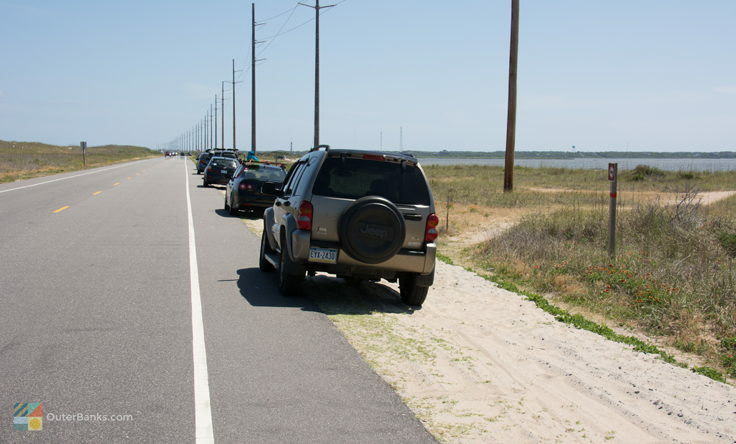 After parking, visitors will notice a sandy path located across NC Highway 12 and leading out to the ocean. This is a popular beach access point for both windsurfers and kiteboarders who need an extra thrill with the Atlantic waves, but it's also a popular family and shelling beach. The beach along Canadian Hole, however, is equally attractive and has thin strips of white sand with clusters of shells bordering the small, lapping waves of the Pamlico Sound. This area truly is ideal for young children as the waters of the Pamlico Sound remain at 2-3' deep levels for hundreds of yards, with small and undisruptive lapping waves, ensuring that little ones have a safe place to play in the water, without the fear of or venturing out too deep, or being pushed over by big breakers. Both children and adults are advised to wear sneakers, flip-flops or "booties" however, as the bottom of the Pamlico Sound can be unpredictably shelly or rocky, increasing the chances of a cut or a scratch. Booties are nylon and / or rubber water shoes that can be cheaply picked up at virtually any souvenir store, and protects the wearers' feet from any unsavory surface. Adult crowds will also enjoy the beaches of Canadian Hole as well, as the area is ideal for both stand-up paddle boarders and kayakers who are just starting out, and like to have a nice section of "practice grounds" to try out their maneuvers. With shallow waters and few waves to compete with, boarding along the sound waters off of Canadian Hole is an easy endeavor, and all a rider in trouble has to do is step off, reposition, and try again. Beachcombers who are adept at sifting through small shell piles along the oceanfront should consider a trip to Canadian Hole as well. While many smaller shell varieties, like augers, periwinkles, olive shells, moon shells, and even tiny whelks, can sometimes be damaged by a rough and large ocean wave when they are deposited onshore, on the soundside, this is never an issue. Along the beaches of Canadian Hole, beachcombers can find all of these varieties, as well as small clams, scallops, and other mollusks that have been white-washed to a stark white after centuries of remaining just under the surface. The big difference between shelling along the oceanfront and shelling along the soundside is that many of the shells that come to the surface on the soundside have been buried for hundreds if not thousands of years, making them slightly less pristine, but fantastic treasures nonetheless. Visitors who may not have an interest in swimming, water sports or shelling, will also want to consider a visit to Canadian Hole as well, as the area offers some of the best and easiest-to-access sunsets on Hatteras Island. Located about 4 miles from both Avon and Buxton, and with ample room for all vehicles, catching a sunset at Canadian Hole is almost an annual tradition of sorts for many long-time vacationers, as the area is easy to get to, and all it takes is a lawn chair and a cold drink to sit back and enjoy the show. Even in the summer months and the peak of the tourism season, the area never really becomes overcrowded with visitors, and sunset lovers can enjoy the view in quiet seclusion, miles away from the rest of the world. The Canadian Hole is essentially busiest during the spring and fall seasons, when local Outer Banks winds hold steady at 10-25 mph, and water sports conditions are at its best. In the summertime, the Canadian Hole is frequented mainly by families, and folks who want an easy-going beach day from an entirely new perspective. May and October are also prime times to visit the Canadian Hole, as while the ocean waters may be a little too cold for swimming, the sound waters are ideal for dipping in a toe or two and enjoying the warmer temperatures. Though mainly known in both regional and international circles as a windsurfer's paradise, Canadian Hole is a family-friendly beach that has something to offer to all Hatteras Island vacationers. Whether your beach-going crew is searching for that perfect sunset spot, alternative shelling locale, or launching point for kayaking or stand-up paddling, chances are Canadian Hole can easily accommodate your needs. Consider doing a quick drive-by of the facilities, (the soundside beach is located just a few feet away from the parking spaces after all), and see what natural attractions Canadian Hole has in store. There's a good chance you'll be back for a breezy day with the kids or a romantic sound sunset, which is why the legend of Canadian Hole continues to thrive among beach lovers even today. Canadian Hole, also known as the Haulover Area, is a popular soundside beach within the Cape Hatteras National Seashore that is located in between Avon and Buxton. For many years, the beach was primarily known for its popularity with windsurfers, and while windsurfers still flock to the area, the site is also a favorite destination for swimming, kayaking, fishing, and sunbathing. The area has a large public parking area with steps to the sand, and seasonal restrooms. Canadian Hole is located in between the Hatteras Island towns of Buxton and Avon, and is roughly two miles away from both communities’ town borders. Is Canadian Hole on the ocean or sound? The public parking area and amenities, (such as restrooms), are located on the edge of the Pamlico Sound. With that being said, Canadian Hole does have a sandy pathway that leads to the beach across NC Highway 12. Can you get to the beach from Canadian Hole? Visitors can easily cross the highway from Canadian Hole to reach the oceanfront via a sandy path through the dunes. Beachgoers will want to watch for traffic, however, as the speed limit on this stretch of NC Highway 12 is 55 mph. 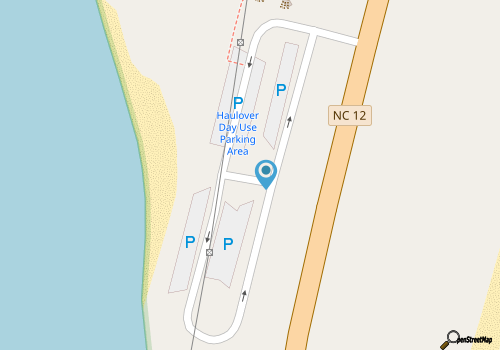 The beach and parking area at Canadian Hole is part of the Cape Hatteras National Seashore, and as such, the area is owned and managed by the National Park Service. How did Canadian Hole get its name? Can you drive on the beach at Canadian Hole? Visitors cannot drive on the soundside beach at Canadian Hole, however, the oceanfront beach across NC Highway 12 is seasonally open to 4WD vehicles via ORV Ramp 38, which is located just south of Avon. In addition, 4WD vehicles can access the soundside beach just north of Canadian Hole, which is known as Kite Point. Is Canadian Hole open year round? Canadian Hole is open to visitors year round, although the shower and restroom facilities tend to close during the winter months. Are there restrooms at Canadian Hole? There are seasonally opened restrooms at Canadian Hole, which are generally available to use from the spring until late fall. Are there showers at Canadian Hole? Canadian Hole does have open-air outdoor showers and foot washes. The showers are “turned on” and available during the warmer seasons, from spring until fall. Where is the easiest spot to catch a sunset on Hatteras Island? Canadian Hole is known as one of the best spots to catch a sunset for its ample parking and front row view of the Pamlico Sound. The expansive public parking area and soundside beach access site is also just steps away from the water. Can you swim at Canadian Hole? Canadian Hole is an ideal spot for swimming, especially for very young visitors who may have a hard time navigating the deeper waters and waves of the Atlantic Ocean. The sound beach stays nicely shallow for hundreds of yards, which makes it a solid spot to wade out and splash around. Visitors should note that the depths of the Canadian Hole sound waters generally don’t get more than waist high. Can you kiteboard at Canadian Hole? 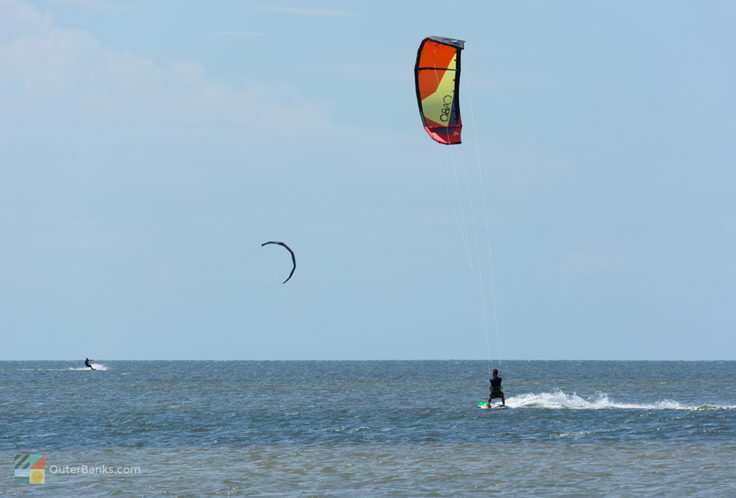 Though Canadian Hole is traditionally known as a windsurfing beach, kiteboarders can launch from Canadian Hole, and the area has become more and more popular with kiteboarders over the past few years. The beach is also just north of Kite Point, which is arguably one of the hottest spots for kiteboarders on southern Hatteras Island. Can you windsurf at Canadian Hole? Canadian Hole was named by windsurfers, and remains one of the most popular public beaches for windsurfers to this day. Because of the convenience and ample parking, and easy launching areas on the water’s edge, this soundside site is ideal for windsurfing fans. Can you fish at Canadian Hole? Fishing is popular at Canadian Hole, as visitors can easily park and tow their gear to the sand. In addition, anglers can wade out into the open Pamlico Sound waters as far as they would like, as the waters rarely get above waist-high levels. The area is a good spot for catching saltwater species that frequent the sound – like bluefish or trout – as well as for cast netting for small bait fish like mullet. Is there a kayak launch at Canadian Hole? There is not a designated kayak launch at Canadian Hole, but paddlers will have no trouble accessing the water. The sound waters are shallow enough to wade out and launch into the open water, although visitors will want to walk out into the sound a bit to get past the ankle-high water’s edge. Can you stand-up paddle board at Canadian Hole? Canadian Hole is ideal for beginning stand-up paddle boarders, as the waters are shallow throughout, which allows riders to easily hop on and off the board. The area may not be challenging enough for advanced watersports fans, however there is a pathway to the oceanfront just across the street from the soundside parking area. Is there a boat launch at Canadian Hole? There is no boat launch at or near Canadian Hole, however kayakers will have an easy time launching in the shallow waters. Motorized vessels will likely find the beach-adjacent waters too shallow for navigation. Are there shells at Canadian Hole? Canadian Hole is unique in that the soundside beach does have ample shells that wash up regularly, but which are often older or fossilized shells that have been buried in the sand for hundreds or thousands of years. Shell hunters will also want to examine their finds carefully, as the beach is a favorite hang-out for hermit crabs, which often commandeer some of the best and most intact shells. Shells may also be covered in watery grasses or algae, so a little cleaning may be required after shell seekers take their finds home. How far is Canadian Hole from Avon? Canadian Hole is a little less than two miles south from the edge of Avon. How far is Canadian Hole from Buxton? Canadian Hole is a little more than two miles north of the town borders of Buxton. Can you camp at Canadian Hole? Overnight camping is not allowed at Canadian Hole, either on the beaches, or in the parking area. The Canadian Hole beach access is a day-use site only. How shallow is the sound at Canadian Hole? The Pamlico Sound waters that border Canadian Hole are very shallow for hundreds of yards. The water is typically ankle or knee-high close to the beach, and gradually increases to waist high the further a swimmer or boarder goes. Unless a visitors ventures way out into the sound, (as in more than .25 miles), it’s very unlikely that the waters will be more than head high. Are there waves at Canadian Hole? Because Canadian Hole is a soundside beach, the only time the area has waves is during a period of very high winds. When the wind is steadily blowing 15 mph or more, (with even higher gusts), Canadian Hole may have choppy waves that rarely reach over 1-2 ft. high. Is there seaweed on the Canadian Hole beaches? Canadian Hole can have swaths of seaweed that wash ashore and line the beach in small piles. In addition, the waters may have ample floating seaweed as well. The presence of seaweed both on the beach and in the sound waters is determined by weather and wind patterns. When is the best time to windsurf at Canadian Hole? Canadian Hole is at its most popular with windsurfers in the spring and fall months, when the winds are consistently high, creating optimal windsurfing conditions. When is the best time to visit Canadian Hole? Families with young swimmers and sunbathers will want to visit Canadian Hole in the spring, summer and fall, when the beaches and the sound waters are nice and warm. 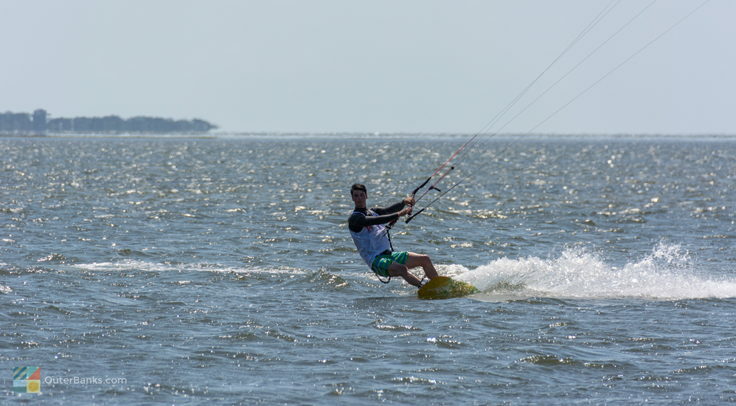 Windsurfers and kiteboarders flock to the area in the spring and fall months, when winds are steady and are ideal for boarding. Visitors can also catch a great sunset at Canadian Hole year-round, especially in the late fall and early spring when the public beach access can be fairly deserted.